HDL and LDL/VLDL Cholesterol Assay Kit | Cell Biolabs, Inc. 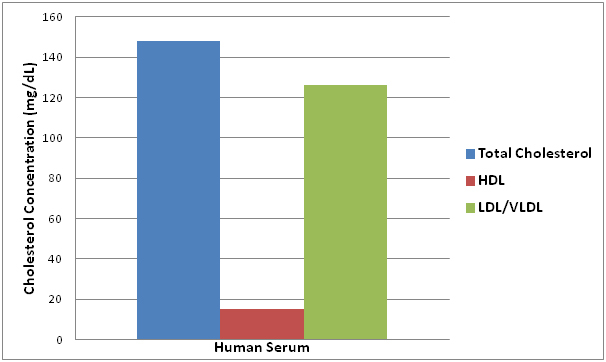 Cell Biolabs’ HDL and LDL/VLDL Cholesterol Assay Kit measures the cholesterol levels of HDL and LDL/VLDL fractions in serum or plasma. 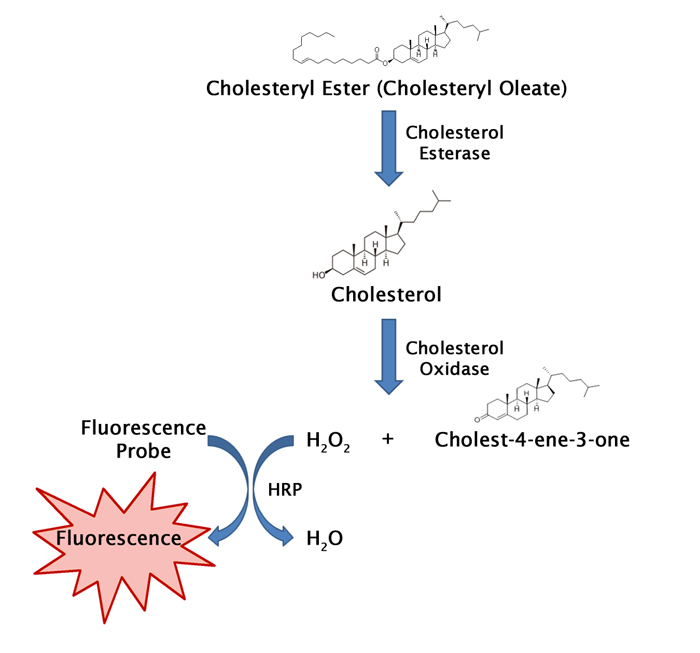 The assay will detect total cholesterol (cholesteryl esters plus free cholesterol) in the presence of cholesterol esterase or only free cholesterol in the absence of the esterase enzyme. 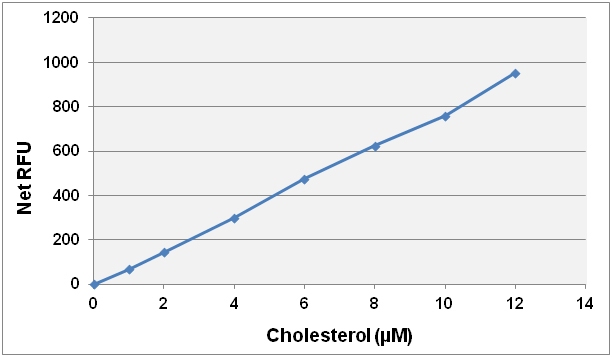 Figure 3: Cholesterol Values of Human Serum Tested Using the HDL and LDL/VLDL Cholesterol Assay Kit. Gamal, S. M. et al. (2016). Effect of gamma-carboxylase inhibition on serum osteocalcin may be partially protective against developing diabetic cardiomyopathy in type 2 diabetic rats. Diab Vasc Dis Res. doi:10.1177/1479164116653239. Angelovich, T. A. et al. (2016). Ex vivo foam cell formation is enhanced in monocytes from older individuals by both extrinsic and intrinsic mechanisms. Exp Gerontol. doi:10.1016/j.exger.2016.04.006. Ali, D. A. et al. (2016). Structural and functional abnormalities of hepatic tissues of male Wistar rats fed on hyper whey and super amino anabolic protein. Nutrition. doi:10.1016/j.nut.2016.01.017. Sessions-Bresnahan, D. R. et al. (2015). Effect of obesity on the preovulatory follicle and lipid fingerprint of equine oocytes. Biol Reprod. doi:10.1095/​biolreprod.115.130187. Maisa, A. et al. (2015). Monocytes from HIV-infected individuals show impaired cholesterol efflux and increased foam cell formation after transendothelial migration. AIDS. doi:10.1097/QAD.0000000000000739. O’Hare, E. A. et al. (2014). Disruption of ldlr causes increased LDL-c and vascular lipid accumulation in a zebrafish model of hypercholesterolemia. J Lipid Res. 55:2242-2253.